Boxing Week Clearance Event Starts Soon! 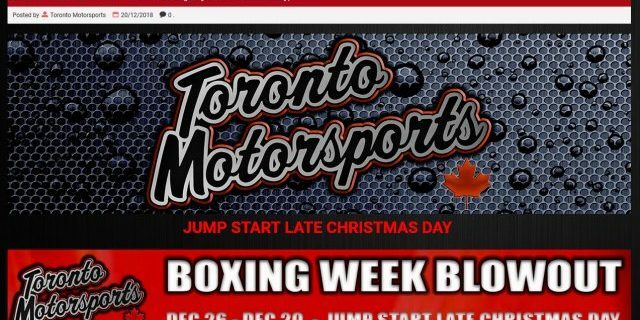 Well, it’s that time of year again where Toronto Motorsports caps off the season with an “all out” Store and Website Clearance. THIS WILL BE OUR BIGGEST CLEARANCE EVER!! Absolutely everything in our inventory will be priced to sell… No gimmicks, just crazy low clearance prices on every single item in stock!!! Although we will do everything possible to keep the website up to date, we cannot guarantee availability on every item. Because of this, we suggest ordering sooner rather than later to ensure the best possible chance of obtaining the desired sale item. The website will naturally operate 24/7 and for those who wish to see us in person or to pick-up orders the store will open 10am-2pm Dec 26 – Dec 29th ONLY!!!. We recommend that pick-up orders be placed on-line and tagged for pick-up to avoid item(s) selling out. Payment must accompany all orders or they will be cancelled. All pick-up orders must be picked up by December 29, 2018, at 2 pm est. PLEASE HELP US SPREAD THE WORD – WE WOULD APPRECIATE MENTIONS ON FORUMS AND SOCIAL MEDIA. PLEASE NOTE: Toronto Motorsports will be closed for our winter hiatus from December 30, 2018, until Monday, January 14th, 2019. The website will continue to process, however, the store will be closed during this time. Emails will be answered during this time, typically within 48 hours. We wish to extend a very Merry Christmas, Happy Holidays and Happy New Year to all.